Environmental psychology is an interdisciplinary field focused on the interplay between individuals and their surroundings. It has a broad definition of ‘environment’, encompassing natural environments, social settings, built environments, learning environments, and informational environments. Environmental psychology is about 100 years old. Let’s place feng shui in the right framework or context so it makes sense and you won’t make false assumptions about how it works and what it can do for you. For modern feng shui to qualify as holistic, integral, it has to be comprehensive, whole and inclusive. The claim I’m making is that a modern, holistic feng shui is more complete, more comprehensive and more whole than almost any other type of feng shui. Ken Wilber proposed the four quadrants model from a simple observation that everything in the known universe can be looked at through one of these four perspectives. The Upper-Left Quadrant: the interior of the individual is a subjective perspective, through which you perceive your private, inner experience (I). The Upper-Right Quadrant: The exterior of the individual is an objective perspective, through which can be seen your biology and behaviour (IT). 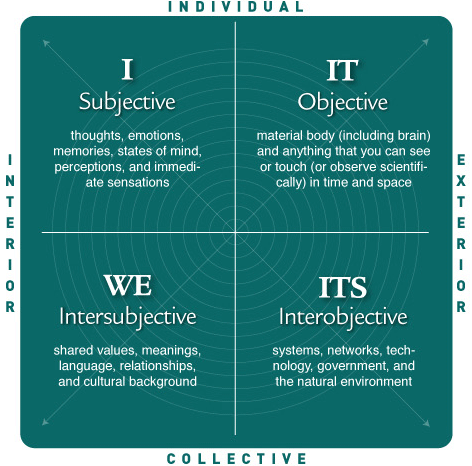 The Lower-Left Quadrant: The interior of the collective is an intersubjective perspective, through which your relationships and broader culture can be perceived (WE). 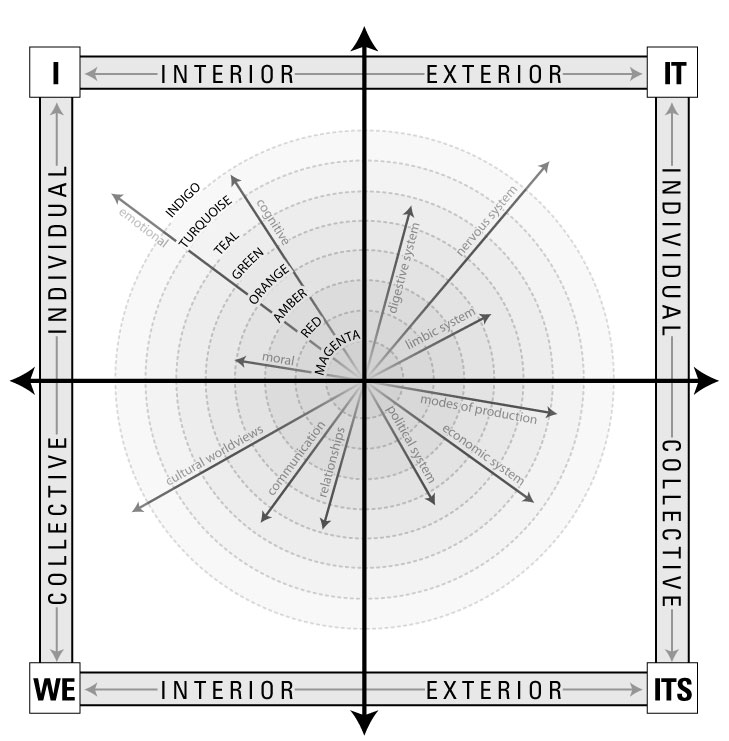 The Lower-Right Quadrant: The exterior of the collective is an interobjective perspective, or a systems perspective, through which networks, the economy and other social systems can be seen (ITS). These four ways or perspectives of looking at your present experience are available to you right now as you’re reading this blog. You can notice your thoughts and feelings as well as your body posture, your breathing and your behaviour (presumably reading this blog, but anything else?). Notice that you understand the meaning of this blog and that in some fashion you can relate to it or not. There are countless systems supporting you and your life right now: environmental, electrical, economic, legal, communication, political, social, etc, etc. Every time you use feng shui you can expand your awareness of your position by 400% just by noticing these four perspectives so your feng shui experience is truly holistic and empowering. What is feng shui for? Posted in What is feng shui?. ← What is Qi / Chi in Feng Shui?